Will Online Gambling Become Legal in the U.S.? Politicians in the U.S. are making noise about legalizing and taxing online gambling in order to take some pressure off of depleted government coffers, but the idea is facing strong opposition from Republicans, conservative groups and pro sports leagues. Democratic Representatives Barney Frank of Massachusetts and Jim McDermott ofWashington are leading an effort to repeal the Unlawful Internet Gambling Enforcement Act, which is set to go into effect on June 1, and instead make online gambling legal so it can be taxed. Their bill would impose a six percent tax on all deposits made to online gambling sites that go to the state of the player's residence, while another two percent would be taken by the federal government. Over the next ten years the bill would bring in roughly $30 billion for state and tribal governments and $42 billion for the federal government, according to an estimate by the Joint Committee on Taxation. "This is a huge boon to the state governments," McDermott said. "If you look across the country you're seeing programs cut. In Arizona, they just cut out a program for children's health for 40,000 kids. Here's a source of money." "American adults want to be able to do what they want with their own money without the government interfering," added Frank. Supporters of the bill have a fight on their hands, however; Republicans have begun circulating a memo tying jailed former lobbyist Jack Abramoff to online gambling, while conservative group Focus on the Family expressed concerns that legalization would lead to rampant abuse. "This basically creates a national casino and there's no time they won't be operating," said Focus on the Family policy and research analysis Chad Hills. "We already have between 15 and 20 million people in the U.S. with a pathological gambling problem." The casino industry, which originally opposed the idea, has now thrown its support behind the bill; professional sports leagues, on the other hand, are against it because of worries that it will "expand wagers placed on their games," which is apparently problematic for some reason. A "scheduling overload" delayed the bill's consideration but Frank, chairman of the House Financial Services Committee, said he plans to have a vote held this spring and is confident it will pass. 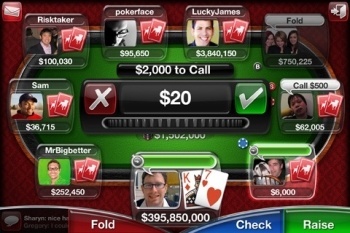 There is no "companion bill" in the Senate but Democrat Senator Robert Menendez of New Jersey introduced a bill in August 2009 that seeks to legalize and tax online poker games and "games of chance."